Those who decide to become a priest have a deep connection to their faith. Making the decision is one that you shouldn’t take lightly and one that often requires a high level of commitment. Priests cannot date or marry, among other rules, and they often need to follow some strict rules in relation to what they can and cannot do. 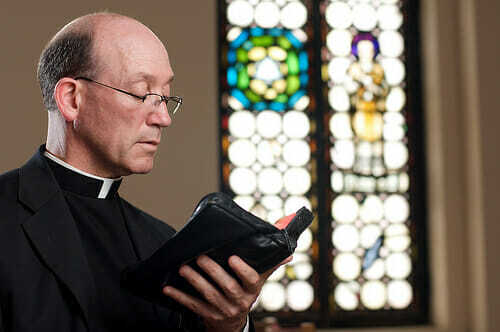 If you feel that working as a priest is the best choice for you, there are a few things you can do before becoming one. Though many churches once hired priests without any college experience, most modern priests go to college and earn a bachelor’s degree before working for any one specific church. Becoming a theology major lets you learn more about your faith and the religious teachings of your organization. This can help you answer the questions that come from your parishioners and make you feel more comfortable with your role within the church. Many theology programs give students the option to work with local churches in various ways to gain some hands on experience. According to the Orthodox Church in America, students who want to become a priest will need to attend the seminary after college. Seminaries are available in cities around the world, and graduates leave those programs with a Master of Divinity degree. Receiving high grades in that program can better help you along your path. Many of the classes in these programs focus on helping students build a better relationship with God, but other classes focus more on how priests can develop better relationships with their parishioners. You’ll also learn more about homilies and how to present your words in front of others. Volunteering in your local church is one of the best ways to gain hands on experience. Priests often work with people from different backgrounds, and they also work with children, adults and those of different ages. Most priests find that the more experience they have, the more comfortable they feel when they begin working. Though you may not offer support in the same way a priest does during your college and seminary years, you can help the church with fundraising programs and in other ways, which will help you feel more comfortable working around parishioners and in the church. Getting ordained takes longer than you might think. When you decide to become a priest and finish your studies, you’ll spend several months up to a year working as a deacon. This gives the church the chance to see your skills, but it also gives you the chance to make sure this is the life you want. The church will then perform a background check on you, meet with some of the instructors from your past and decide if you have what it takes. Once you become ordained, the church will appoint you to a specific church. Priests help parishioners with their individual struggles, but they also lead services and offer other support and services when needed. The process of becoming one can take up to eight years or longer. If you feel that you have the commitment required to become a priest, prepare yourself to spend four years in college and another few years in the seminary.